They say the first casualty of war is the plan - as this is broadly true of any project - including a garden design. However accurate the survey and meticulously detailed the design there are always anomolies once the landscapers get on site. It's unforgiveable if the designer hasn't taken account of the basics like drains but all manner of unknowns lurk beneath the surface to cause the design and build team a headache. Most landscapers I've worked with usually are quick to point out these hitches but equally quick to come up with a solution; a good designer will anticipate likely problems and be ready to be on hand with the resolution process. They should have in mind how the finished project should look, at least in hard materials and not allow details to slide for the sake of expediancy or time. Cost is separate issue that will have been negotioated before the vans turn up and even this can subject to reveiw...Communication between all parties is key. Any design, however thought through and detailed, is only ever a skeleton on which to build. Many clients can be really excited about their new garden but a find it really difficult to visualise in reality. Even 3D renderings aren't the same as having it there outside your back door. Once the bones of the new garden start to take shape however, the client may start to have light bulb moments - and make changes and add details of their own. In my view this is to be welcomed - the more involved the client becomes the more likely the ultimate garden will be a success - one that they feel fully involved with and want to care for. Mananging this is really the designer's job - to listen to the client's concerns and ideas and find practical resolutions with the landscaper. The latest projects to arise from the mud- or concrete after weeks of hot sunshine - are a soon to be garden on a new build site - a very high spec house but on an awkward, sloping site (aren't they all?!) In this case the builder still on site felt obligated to complete the exterior so agreed to lay the patio ( for an agreed cost) rather than lay unwanted turf. For me this rushed the design process a bit but we all saw the benefit of utilising skilled labour ready to go. 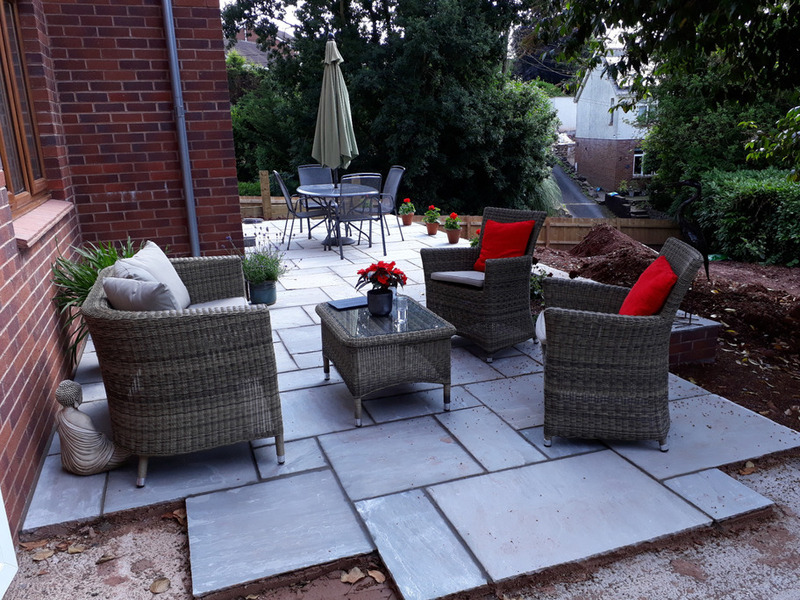 Result - clients with a patio to relax on for the rest of the summer, who were prepared to wait for another landscaper to finish the job. This may not sound ideal but with any project there is a need to adapt to changing circumstances - and for me working with people the clients are happy with, is crucial for ensuring good communication all round.